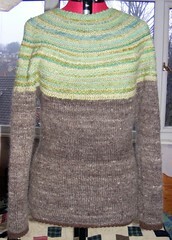 This came off the needles at the weekend, having been started on New Year's Day and taking just 15 days. All of it is yarn from the stash, the main brown stuff being Corriedale/Shetland dark brown wool blended with tussah silk, dating back several years. The yoke is assorted handspun, mostly wool, some superwash, some various blends including cashmere and silk. The full details are Ravelled. This is quite a good indication of the green, less so the brown. The brown's right here but the green has washed out. I went back and picked up for the edging from the cast ons, using a slightly smaller needle and a finer, different yarn - having not a scrap of the original left. 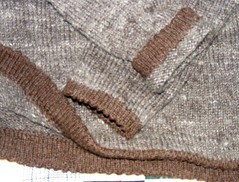 I knitted an inch or so, did a row of yo k2tog, then knitted a facing, cast it off and sewed it down. 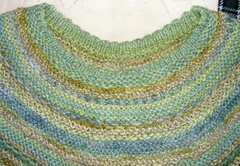 Collar and yoke. This time I sewed the facing down live to preserve maximun stretch. 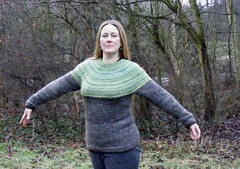 I'm really pleased with the fit on this one - slight negative ease so it's huggy - and it's wonderfully warm. I ordered Solveig Gustaffson's Gold sweater kit last Sunday evening, and it arrived on Friday. Utterly, utterly wonderful yarn and colours - but at that price it should be. I think this will be saved for the Knitting Olympics, though I probably won't formally join a team. And looking it up to add the link, it looks as if everyone else has the same idea - of course, I should have realised how apposite the name is. But I've wanted it for ages, and have nearly cleared out last year's fibre stocks (still a bit left to post up) to pay for it. I've just updated the Etsy shop with most of my remaining fibre from last year (the rest will be up when I'm not so frozen) and IT'S ALL DISCOUNTED. There is also FREE UK SHIPPING. I need to start thinking about next year - getting in the fibre, planning new colours, working out what was the most popular last year and worth repeating, and what didn't seem to go down well. All ideas very gratefully received. Going back downstairs to the warmth now, while I can still feel my fingers!